Almost five years ago my doctor broke the news that I needed to forever cut gluten and dairy out of my diet. (You can read why here). When my doctor first mouthed these words, I thought my life was over.... I literally had dreams at night about eating croissants and spreading loads of dairy filled creme cheese on gluten-filled bagels... I would wake up hungry, haha! BUT...as i've found, my life just got more creative once I cut these bad-boys out, and i've learned to cook, bake and find AMAZING flavor filled food to feast on in all parts of the world:) There really are so many delicious treats to sink your teeth into that naturally don't contain gluten or dairy. 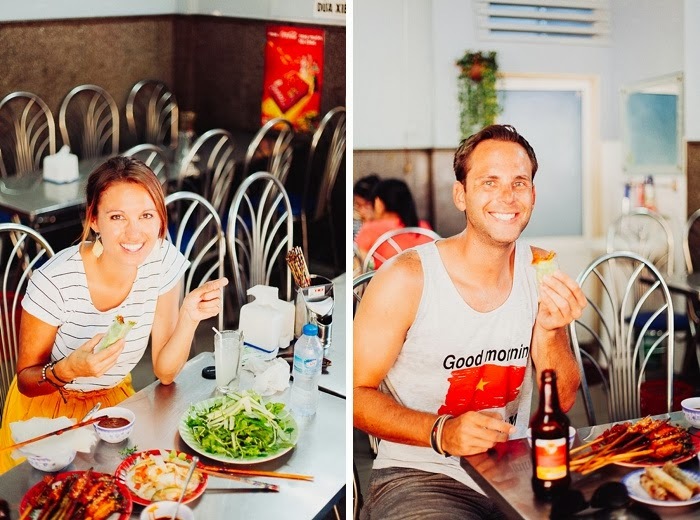 I've had quite a few people over the years ask me how I stick to my diet when I travel, and I thought I'd share some of the things i've learned along the way. When Kevin and I lived in Nepal, we quickly learned it was almost impossible to explain the word "gluten" cross-culturally. (Even a handful of waiters in the USA have given me the blank stare when I say i'm gluten free!). And I always felt so embarrassed that I was the crazy American making a scene. So, in order to avoid a scene and be discreet about my allergies, I asked my really good Nepali friend if he would write my allergies on an index card in Nepali. Essentially the card read "I am allergic to gluten (wheat, barley, rye) and dairy (cheese, milk, butter)" in Nepali. I would quietly slip my card to the waiter to ask what menu items were best for my limitations. I can't tell you how well this worked for me! The waiters were always so kind and when reading it in their native tongue, knew exactly what I could and couldn't eat. They always assured me they would let the chef know, and I truly believe they did because I hardly ever got sick. 2. Look for menu items that are naturally gluten free, and then ask a few questions about any hidden ingredients. Generally speaking, most restaurants in the world won't have a gluten free menu, but they will have naturally occurring gluten free items. If I see grilled chicken with sautéed veggies on the side, I can infer that this might be a meal that could potentially be allergy free. Once I find the dishes that look naturally gluten free, I will then slip my allergy card to the waiter, and asked there are any hidden ingredients (i.e. : if it's cooked in butter or if the sauce has milk or gluten items in it). If the chicken is cooked in butter, often they are fine with using oil instead. It's generally easy to make modifications with dairy…just skip the cheese, oil instead of butter, or no cream sauce! Especially in Europe we will hit the grocery stores like crazy! Not only is it way cheaper to generally get your breakfast/lunch from a grocery store, but it allows you the freedom to know exactly what you are putting in your body. Europe is amazing at having gluten free options (and sometimes even gluten free sections designated in the store). Generally I will buy a loaf of gluten free bread and veggies and meat (like salami) to put in it. I will also buy fruit and crackers (and dark chocolate!) for a snack. If you are staying in a place with a kitchen, then you can make delicious dinners with fresh salads, gluten free pasta or grilled/cooked meats! Pad Thai- no soy sauce, unless they check the ingredients on the soy sauce and it has no wheat. The noodles are rice noodles so are good to go! Fresh Coconut- These are my favorite! You can order them almost anywhere, drink the milk and then eat the flesh. Yum! Fruit smoothies- Asia is known for their delicious fruit juices that literally just contain water and juice straight from the fruit. You'll want to just clarify that there are no additives besides water and fruit. 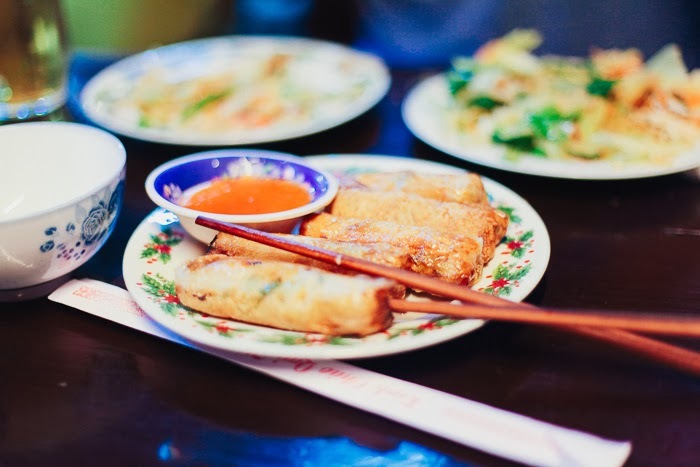 Egg Rolls- Many of the egg rolls we found in Cambodia were wrapped in rice paper, and not in egg paper (which is made with wheat flour. Just double check they are made with rice flour, and no soy sauce! Cau Lau- This is a local dish they make in Hoi An, Vietnam. They use rice noodles, meat and veggies. It was so good that we went back multiple times! Fresh fish- we ate a lot of sea food on our cruise in Halong Bay, Vietnam. Most if was just seasoned with spices and oil and then grilled, so good. 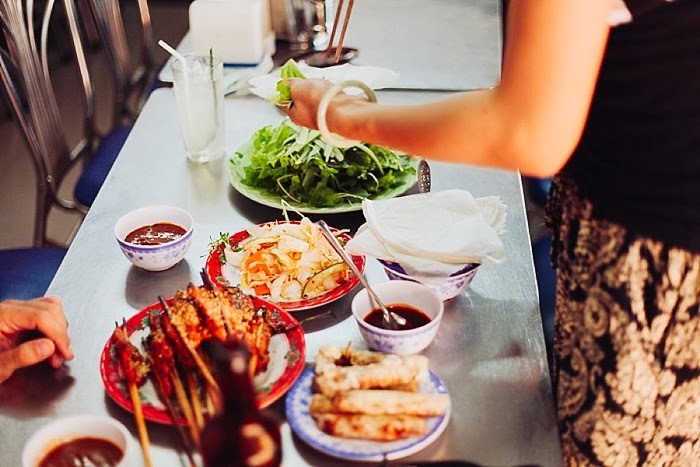 Bale Well- If you eat one meal in all of Vietnam, make it at the delicious Bale Well restaurant in Hoi An. The two pictures directly above and below are us savoring this delicious concoction. The restaurant only makes 1 item, but that one item is filled with the most delicious foods and together they are a party in your mouth! 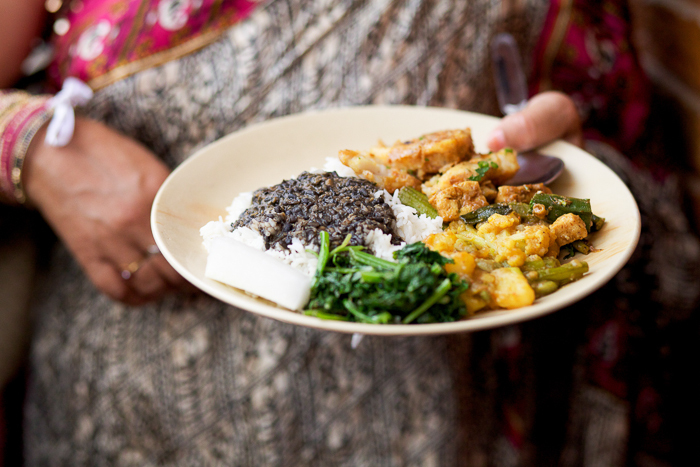 Dal Bhat- This is a staple in both countries of rice and lentils. No gluten or dairy here! **Please be aware that Chicken Tikka and Chicken Biryani both have dairy in them. I didn't realize this when I was in India. It honestly looked like spiced meat to me, and I had no idea that yogurt and butter are a part of the recipes. Kurkuri- While i'm not a huge junk food fan, I did fall hard for the Nepali version of the cheeto. It's made with gram flour (which is gluten free) and is spiced with masala spices to give it a kick. If you need a quick snack (like if you're in the airport), that's a good one. Japan: Japan is a wonderful place to eat allergy free. Sushi at it's most basic, made of rice, seaweed and meat, is generally gluten and dairy free. I've heard crab meat often has wheat in it, and cheap wasabi can have wheat fillers as well. So just do your due diligence and double check before popping that roll into your mouth. I'm a pretty simple sushi eater and love avocado rolls, which are generally good to go! France: There are some great gluten/dairy free options in France, however you still will drool every time you pass a patisserie where the smell of fresh baked bread will wrap you up like a warm hug. However, I did discover a cute little allergy free bakery in Paris called Helmut Newcake that serves gluten and vegan items. 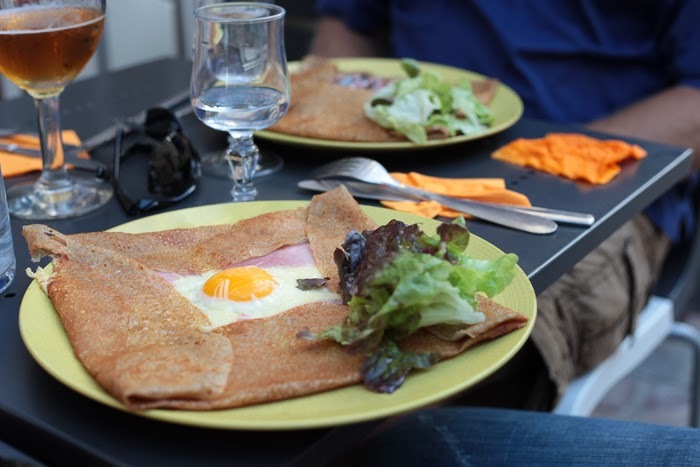 My HUGE discovery while in Paris, which was a total game-changer, was when I realized galletes (savory crepes) are made with buckwheat flour which is gluten free!! This opened my options considerably, as I could always order a gallete with whatever toppings I desired (sometimes sweet, and sometimes savory!). And, while I didn't see too many alternative milks in France (almond, rice, coconut, etc) my guess is that it's on the rise, so try ordering your delicious cafe au lait with a different kind of milk!! In the Alsace region of France, a wonderful dish worth trying is called rosti. It's sliced potatoes and vegetable baked in the oven with a sauce. Many rosti's have cheese, but I found plenty that just had meat and vegetables and potatoes in them. Try the one with the mustard sauce because it doesn't have dairy in it like the other sauces, yum! At the Christmas markets, I drank the vin chaud (hot wine) and ate macaroons (that just had coconut, egg and sugar in them). At the Christmas market in Kayserberg there was a vegan and gluten free food stall. I was in heaven. I got vegan hot chocolate and a savory gluten free crepe. UK and Ireland: I had the least amount of trouble in the UK and Ireland, they were so accommodating and the food was quite good. A proper English or Irish breakfast is almost all gluten and dairy free, with eggs, bacon, sausage, tomatos, beans, and toast. You'll obviously want to skip the toast (unless they have a g-free option) and then follow-up and make sure the sausage has no wheat or dairy additives (which is sadly quite common in the USA). I found that most restaurants had a really yummy grilled or roasted chicken with potatoes or other veggies, and can be cooked with oil (and not butter). I loved how cozy it was finding a quaint pup out in the countryside with a huge roaring fire, and eating some delicious meat and potatoes! And, grocery stores in these places had wonderful options! While in Harrogate England my good friend wanted to find me some proper gluten free biscuits (cookies) to have at tea time. The aisle was chock full of options, I was so amazed! Turkey: In Istanbul, you will be surrounded by meat kabobs and more meat kabobs! It was really hard figuring out what the meat was marinated in, so if I found a place that could describe the spices to me, I would generally try it and tended to have good luck. Turkey also has a delicious dish called Fasulye Pilaki which is essentially white cannellini beans cooked with onions, garlic, carrot and potato in olive oil. I loved the bean dishes so much. In Cappadocia, they have a delicious stew called Testi Kebab which is cooked in a ceramic pot, broken open at the table, and served with rice. Our favorite night in Cappadocia we tried the testi kabab (you can read more here). Like other mediterranean countries, the hummus, olives, pickled veggies, and fresh salads were amazing. Greece: While I wasn't a huge fan of the kabob meat in Turkey, I LOVED the gyro meat in Greece. I generally would order a gyro without the pita bread or taziki sauce. I loved the greek salads and on occasion ate the fresh feta on top because it was made of sheep's milk which didn't seem to bother me. I also ate dolmas, which is ground meat and spices wrapped in grape leaves, and of course olives, hummus, fresh veggies, etc! Belgium: With lots of French influence, you can order galletes, and find a good variety of allergy free things in the grocery store. A popular dish in Belgium is french fries, which they call frites. They have them all over Belgium, and I love them. Make sure the place you are ordering the frites from don't fry any gluten in the same oil as the fries. When we were in Bruge, there was a little cart in the main square that sells only frites, which guarantees that they are gluten free as their only ingredients were potatoes fried in oil. Holland: The best allergy free market I found in Europe happened to be in Delft, Holland called The Eko Plaza. It had a juice bar and tons of vegan options. I found the most delicious dairy free pesto and wanted to buy the whole shelf of it! This is a link to a great resource on gluten free in Amsterdam. Holland also sells the delicious frites just like Belgium! Germany: Sausages, sauerkraut and mustard are all gluten/dairy free, hooray! As with most things, you will want to double check the ingredients of the sausage as sneaky little additives can find their way in them, but I found so many yummy sausages that were just meat and spices. You can find really good cooked vegetables as well. Sweden: I am always a bit spoiled in Sweden because my family lives there and my cousin is a professional chef and makes the most amazing gluten and dairy free meals. It's expensive to eat out here, so grocery shopping is your best best (get items to make delicious swedish meatballs and lingonberry sauce!!) . However, if you do eat out I found that salads are a great option, as well as cooked vegetables (they are big on potatoes) and meat. One good restaurant I would recommend is Urban Deli. You can see more links to gluten free in Stockholm here. Central and South AmericaEating gluten and dairy free is pretty darn easy in most countries in central and south america. Mexican cuisine has so many naturally gluten free items like tacos, chips and salsa or guacamole, rice and beans, and fresh fruit. While other countries in these regions have food that differs from Mexican, it's staples are still beans and rice (like Ecuador). 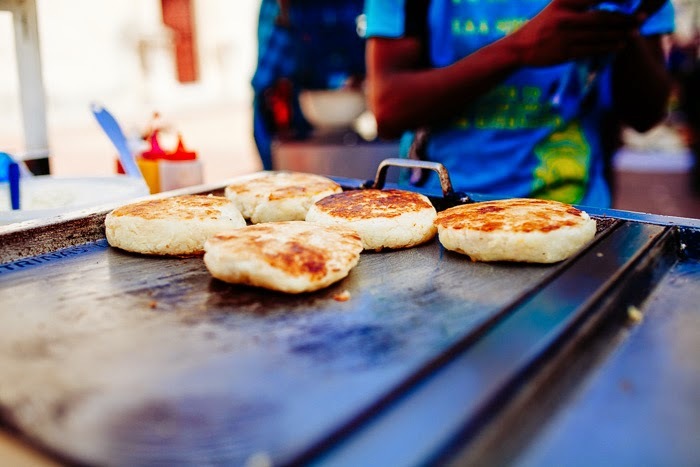 I loved the friend plantain in many parts of the south america, and Colombia had amazing arepas (just make sure you don't get the cheese-filled kind). If you do order carne asada (like in a taco) just make sure it does not contain wheat in the marinade. We used to live in a hispanic neighborhood and our local bodega (supermarket) sold carne asada that was marinaded with wheat ingredients in it. Ugali, a staple in East Africa is gluten free, which is a good thing as I ate it almost every day when I was in Kenya! Root vegetables are also popular which is great because they are g/d free as well. In South Africa, they will offer you Roibos tea all day long. Politely ask for no milk (or a milk substitute if they have one). They are also big on their meats, so just double check the marinades. Any other tips you guys have? Or g/d-free foods you feasted on in a country? This list is by no means extensive, just things I could remember from our time in each country!! I hope it was helpful. The bottom line is that you should not be afraid to travel because of your allergies. You can and will find things to eat. Just do your research before hand and you will be set. With all aspects of traveling, be flexible. Bring snacks from home, and if you get sick because a sneaky allergy got in your food, remember that you were brave to venture out and sometimes things just don't go as planned and that's ok!! Travel on friend! PS- My amazing friend Christina just created a vegan guide to Los Angeles. She is in a contest and she'd love your support. Feel free to watch her video on her vegan guide, and comment and like it which will give her extra support!! You can see her video here.